Musician, painter, digital artist, photographer, writer. in the Canary Islands, based in the United Kingdom since 1989.
a national prize at age 18 which kick-started his career as a painter. Department for a co-operative founded by the students. experimenting with computer graphics. His work was published in TOPY, Implant, Chaos International, Planet Art Network and was showed at exhibitions around London and the South West of England. 1994 brought him to the south of Germany by the hand of Anya Hubschle for an unforgettable October of pure magic, love, amanita muscaria, Halloween in the Black Forest and his first experience of life in an intentional community or ecovillage (that of the Wagenburgh outside Tubingen), which proved to be a very formative experience. 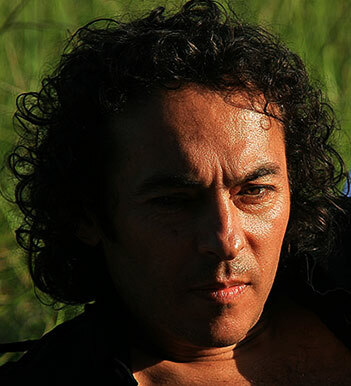 In 1999, after four years of independently studying the Maya civilization and their calendars, he trained in Chile under visionary art historian and Mayan Revival pioneer Jose Arguelles PhD and started lecturing and facilitating workshops in the UK, Spain, Portugal and eventually the US, which lead him to stay in California and Missouri between 2003 and 2004. During the US period Xavier worked with best-selling author Ken Carey creating his official website (now sadly defunct). This encounter was a source of great insights, high inspiration and multicoloured fireball storms. At this time also, he became involved with Greenfire 7 Generations Eco-Ministry and the Global Eco-Village Network as an artist, itinerant info-cell, connective agent, workshop facilitator and event organiser. He was a guest speaker at the GEN Conference at the seminal ecovillage The Farm (Tennessee). Upon his return to the UK in 2004, now in Bath, he undertook photography professionally and focussed on developing his painting and digital graphics skills. His work was shown in December 2006 at an individual exhibition in Walcot Chapel (Bath), under the title: "Return of the Prodigal Sun". More recently he's stepped up his ongoing research and work within the UK ecovillage and intentional community scene to try and find new models for highly efficient settlements and better communication between communities. To aid with his design skills he is taking up the full Permaculture Design training. Xavier has also worked as a free-lance journalist, text translator, interpreter and Spanish language teacher, actor and walk-on artiste with small roles for TV and film productions. His paintings, photographies and graphic works are in private collections across Europe and the Americas. Xavier's interests include all kinds of esoteric lore, mythology, gnosticism, linguistics, semiotics, mayan calendrics, archaeo-astronomy, alchemy, mysticism, permaculture, numerology, cloud-gazing, tree-staring, star-watching, crystal cathedral building and, very specially, Vippassana meditation.